Yes they have the micro chip attached simply insert cartridges and print. 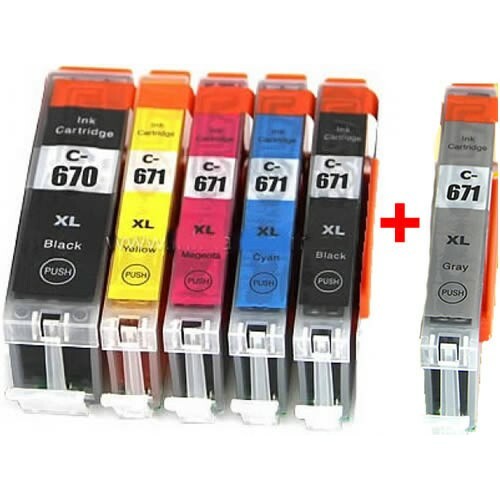 Yes your printer will recognize these cartridges and they will show the correct ink levels and the small red light will light up when installed the same as the Canon cartridges. You can select any combination of 6 cartridges with this pack if you don't want the standard 1 of each. Simply write the combination you want in the comments box on the checkout page. Ripper service, overnight delivery and non Canon brand cartridges which work exactly the same at a fraction of the price. Was told about Ink Hub by a family member and really glad that I was. A1 product and super fast delivery time. Was very hesitant about trying generic cartridges due to a nightmare experience in the past. So far after two orders I feel confident that the Ink Hub cartridges are very good. I will tell others as so far my experience has been very good. Very surprised that these cartridges don't give any warning message and also the ink level reads correctly. Had a small issue when installing so called the man at Ink Hub and I had forgot to remove the small tape on the top of each cartridge. Once removed they worked fine. Very good back up service by these people as many companies your ring give you the run around or else don't know much about their own products. Great local company.